Malibu Shark Attack (also known as Mega Shark Of Malibu) is a fun "death from the deep" B-grade film, with a difference - there is a school of giant prehistoric killer goblin sharks, swimming towards the land at record speed, within a mega tsunami, bigger than any wave even recorded, during the existence of man kind. There were many things to pick at in this film, like how clear the water is after the tsunami hits and how a tiny lifeguard hut, right on the beach and made out of extremely light material isn't smashed to pieces, when thousands of inland houses and all the surrounding bridges have been. Not to mention the fact that the sharks don't seem to have a mouth that pops out enough whenever they bite something, which, apart from their long snout, is what makes these deep sea killer creatures so unique. They also don't have the traditional body shape of a goblin shark. It is also stated in the film, that goblin sharks have been extinct for millions of years, which is untrue, as they still exist today, living in the deep waters of Japan. But in saying all that, Malibu Shark Attack is still a great "death from the deep" film, filled with stereotypes, funny and sometimes memorable dialogue, a decent amount of gore and a lot of scary looking computer-animated goblin sharks. This film follows a group of lifesavers, trapped in the local lifeguard hut, after a massive tsunami hits the coast of Malibu and to make matters worse, an entire school of giant killer goblin sharks have been unleashed from beneath the ocean, after an off shore earthquake. The sharks are being attracted by the blood flowing from the leg of one of the lifeguards and it's only a matter of time before they burst up from beneath the floor and the feeding frenzy begins. Malibu Shark Attack is a great film, for all "death from the deep" B-grade movie fans, just tries not to think too much about all the nitty-gritty details of realism. 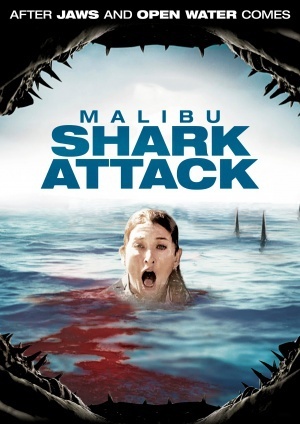 Malibu Shark Attack is rated M for mature audiences as it contains sexual references, creature violence, violence, gore and natural disasters and was originally released on DVD in 2010. Still hungry for more "Death from the Deep" films? Check out Piranha Piranha (1972), Piranha (1978), Shark, Swamp Shark, Devil Fish (Monster Shark), Jaws 5: Cruel Jaws, Sand Sharks, Jurassic Shark and if you're looking for one suitable for the kids, Ice Age 2: The Meltdown. Why? For fans of killer animal films!